In the US context, when it comes to maternity care and pregnancy, that means focusing on communities of color. We simply cannot consider ourselves birth activists if we are not focusing our energy on improving maternal outcomes for women of color, especially African-American women. For women of color, racism in our society is manifesting itself in our bodies, in our health, in the likelihood we will live or we will die. Race isn’t the only factor in determining who faces serious challenges in pregnancy and birth, but it’s a major one. And the relative silence among doulas, midwives and birth activists around race-based health disparities in maternal health is appalling. Black women are four times more likely to die during childbirth than white women. FOUR TIMES. I often feel like I’m a broken record on repeat when I constantly bring this up, but until this issue gets as much airtime as others in our movement, I’ll keep repeating myself. And remember, these disparities exist in a country where 99% of people give birth in hospitals, and where we spend more per capita on maternal health care than anyone else in the world. Our health care system is literally killing moms and babies of color. I’m not going to pretend that talking about race, and working to combat racism, is easy. It’s especially not easy for a group that is majority white, as doulas and midwives are. But working to create a world where everyone can create the family that they want to create is not easy work. I understand what it means to grapple with privilege around race, but choose to do it anyway. I’m Latina, but I’m also light-skinned and mixed race. I walk around the world and don’t experience the kind of racism that darker skinned folks experience. My community, Latinas, while we experience higher rates of maternal and infant mortality than whites, we don’t experience the extremely high levels faced by Black women. That means I have to work as an ally, in solidarity with other people of color. It isn’t always comfortable, but I do it anyway. We all have to. If you’re white, you’ll have to navigate what that looks like for yourself. But you have to do it. There really is no choice, unless we’re okay with the status quo continuing. Focusing our work on those who experience the most marginalization, who are fighting to keep themselves and their kids alive isn’t just the right thing to do–it’s also the most strategic. If we work to address the conditions that have created the disparities I mentioned above, everyone’s experience will improve. Things like creating a culture of respect among providers for patients, addressing the way subconscious bias and prejudice impact medical decision making, and much more–all of those things will improve birth experiences and outcomes for everyone. But if we continue to do what many of the birth activist efforts are doing–for example creating birth center environments that cater to and primarily serve wealthy and middle class white women–we know that everyone’s experiences won’t improve. They already aren’t improving. A few decades of home birth midwifery advocacy and birth center work hasn’t made a dent in maternal and infant mortality rates for women of color. In fact, in some places, the rates have actually gotten worse. This rise isn’t the fault of the midwifery or birth activist movement, but we have to take a real hard look around at what we’re doing and really question if our resources are going to the right place. I don’t want to ignore the fact that there exist really important efforts focused on reducing race-based health disparities in maternal health. But it’s nowhere near enough. As our movement grows and expands, we need to make sure we aren’t trading our ability to be effective for institutional support. In social change movements, interveners play a really crucial role. Interveners provide immediate relief, usually on a small scale, within a system that is challenging or hostile. All of us, in one way or another, have been interveners. While interveners often have to fight really hard to get into these systems, they also have a pretty powerful ability to have impact once they are there. One of the main reasons for this, I believe, is that as interveners we are only responsible to the people we’re coming in to support or serve. We’re not accountable to the system itself, or the other structures that support it. For doulas this has been crucial to our success in improving individual people’s birth experiences. When you’re only accountable to the person giving birth, you are able to provide the best most unadulterated support. It’s an amazing thing to be able to do. As the doula movement has grown, become popularized, this role as interveners is changing. Doulas are actually becoming part of the system that we started out simply trying to alter. There are doulas who are hospital employees, as well as nurses and doctors who have also trained or worked as doulas. There are doulas who are reimbursed by medicaid and even some private insurance companies. We’re no longer simply another body in the room, working to shift the balance of power and offer a supportive hand or helpful tip to someone giving birth. We’re a part of the system now. This has major pros and cons. The biggest pro is that this vastly improves the accessibility of doulas and doula care. Way more people can have a doula if there are ways to find one outside of a private market where individuals have to find and fund their own doulas. For doulas to be able to meet the first point I just iterated about serving those who face the greatest challenge, this kind of accessibility is crucial. 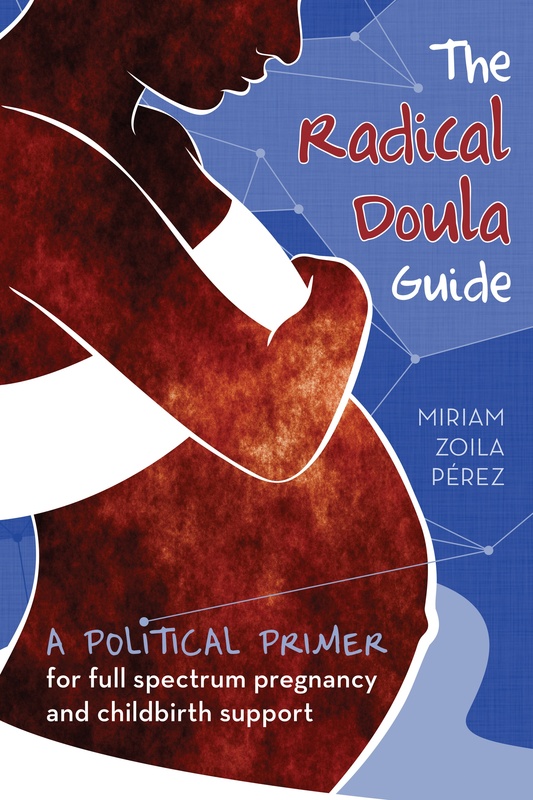 Even if we see doula work as activism, we all live in a capitalist system that requires us to make a living and pay for basic goods and services. That means that unfunded or unpaid doula work is always going to be limited in scale, at least within the professionalized model we’ve developed. Only so many people can provide those services for free. So institutional support means more doulas and more people receiving the support. Without that support, the only people with doulas will be those who have access to major resources–and I’d argue that those folks don’t really need more support. That doesn’t mean they won’t benefit from it, but the real life and death needs when it comes to maternity care exist within low-income communities and communities of color. That is where maternal and infant mortality are at appalling high levels. But I’m concerned about the cons as well. I’m concerned about the way in which moving from being an intervener to being part of the system might limit our ability to make the changes and have the impact we’ve been able to have. Mostly I’m concerned about how being part of the institutions, particularly when they are supporting our services, means we can no longer simply be accountable to the person we are supporting. Instead we are also accountable to the people paying for our services, or to the hospital that allows us in, or to all of these institutions and their definition of what our role should be. In order to ensure that we’re not creating a movement or a profession at the expense of actually making change, we have to be willing to ask questions that might put our individual livelihood at stake. We have to prioritize what allows us to serve the most people, and make the most change, over what allows us as individuals to make a living. It’s a huge challenge, and individual survival is not a trivial issue. But do we really want to be creating a whole new class of experts in the health care system? Do we want to be adding another professional in the room who has to be paid for? And more importantly, in that model, do we actually continue to have the impact we’re seeking? I’ve never made a living from doula work, so I realize that I have some distance from this question of making a living that is a privilege. But if this movement is really about social change, we all need to get a moment to put our own stake in this aside and figure out what is the most effective way to achieve the change we’re working towards. I’m dreaming about models that work to deprofessionalize doula care, and instead help community members reconnect with the skill of providing support to one another. I dream of a world where everyone has a family member or friend they can ask to serve in this role, and a world where our health care system is structured around making sure that everyone has this support, rather than structured in a way that makes providing this support impossible or requires hiring a professional. I don’t have the answers, but I hope you’ll consider continuing to ask these questions. For our work to be part of the reproductive justice movement, we have to maintain our commitment to providing unconditional and nonjudgmental support. I see doulas, midwives and birth activists as crucial to this mission of reproductive justice. But the most important part of the definition is “the family that they want to create.” I believe strongly that I do not know what is best for anyone but myself. That includes not knowing what kind of birth is best, what kind of family size or structure or arrangement is best. That includes not knowing what kind of diet is best, what kind of exercise regimen, what kind of medicine or birth environment or position during labor. This approach, particularly when many of us are now part of professions where our position as an expert is necessary for our livelihood, flies in the face of how our society works. And that’s precisely why I think it’s key. Not knowing what is best for someone else does not mean not providing information, opinions or advice. But when we fundamentally believe in the other person’s intuition and decision-making as the best guide for their actions, the way we approach giving advice or suggestions looks really different. The point of birth activist work is not to replicate the medical model simply with a different set of recommendations or opinions about what is best. The point is to provide something altogether different, something that creates a way for pregnant and parenting people to receive unconditional and nonjudgmental support that affirms their autonomy, their expertise, their way of living in the world. This is why I consider myself part of the full-spectrum doula movement, and why I’ve volunteered as an abortion, miscarriage and adoption doula. I support any and all choices that pregnant and parenting people make, and my values tell me that all people deserve support and affirmation for those choices. I may not agree with everything, but I believe that leaving my opinions, and obviously I have strong ones, at the door is a part of what it means to be a doula. I’m there to affirm and support your decisions, your choices, and provide encouragement, information if it’s asked for, and to simply be a witness in someone else’s journey. It’s no easy task, but it has to be at the center of our work for us to truly be building that world. It’s not about building a world where everyone creates families in the exact way we think is best, or right. It’s about creating an environment where all families can thrive. thank you for sharing this! I’m a midwife student in the DC area and would love to one day talk with you about how to make my services available to all women while still supporting my family financially, as well as other radical ideas to incorporate into my practice! This made me think of how I respond to people who ask me about doula work (especially people in the nursing profession) when they ask “So what is the training for becoming a doula?” I have gone on tirade after tirade with other doulas about the futility of certification, but I find myself wanting to legitimize the profession to them by answering “Oh yes there is a certification process, and you have to go to blank class and read x books,” almost professionalizing it more than it actually is already by orgs like DONA. Then I feel all dirty because it is so disingenuous to what I actually think about what makes a doula a doula. But then I think of how they would react if I just said, “yea there is but it isn’t necessary!” and how the safety net of institutionalized processes would be yanked out from under my conversation and I decide to go with my, “oh yes it’s very stringent” shpiel. I appreciate you making this statement about how the doula’s role is becoming increasingly integrated in the systems we are reacting against. It was an important reminder for me and something I hope we can find creative ways of challenging. Totally understand that tension Andie, and that’s exactly where these processes come from in the first place. From the desire to legitimize the role in the eyes of a medical profession that is wholly created based on a culture of training and licensing and certification. And the rest of our culture has similar approaches to legitimizing certain types of work and professions. Some of these moments feel like inside vs outside questions–like what convos do we have when we’re talking to ourselves (meaning other doulas) and how do those change when we’re talking to the broader world. This is definitely one of those places where I feel that tension strongly.